Calvin Klein Escape For Menn is a spirited scent that captures man’s desire for freedom that transcends the boundaries of everyday life. Designed to evoke a lasting impression, the Calvin Klein Escape For Men fragrance is as individual and adventurous as the man who wears it. 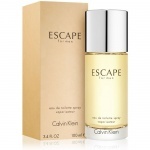 Calvin Klein Escape For Men is a complex and yet refreshing essence that blends eucalyptus, melon, juniper, grapefruit, mango and bergamot over aromatic middle notes of rosemary, cypress, fir, sage, birch and sea notes and a base of sandalwood, amber, patchouli, oakmoss and vetiver. Calvin Klein Escape For Men is a spirited scent that captures man’s desire for freedom that transcends the boundaries of everyday life. Designed to evoke a lasting impression, the Calvin Klein Escape For Men fragrance is as individual and adventurous as the man who wears it.